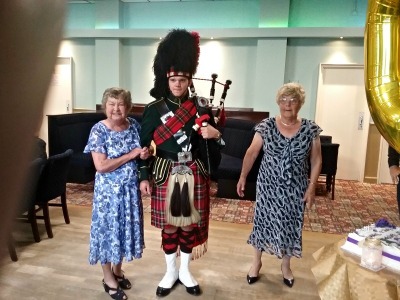 I recently traveled to Coventry, from Finland to my Aunt's 80th birthday, needless to say they had to have a piper. Here they are with the piper. 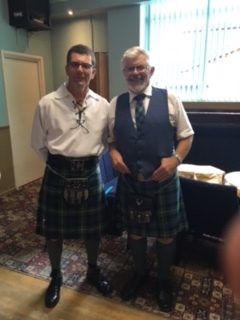 My cousin and I both wore the McKenzie tartan, but I am a bit more old fashioned and although I was contemplating wearing the full dress jacket I thought it was a bit over the top for an afternoon party. It goes to show how two people each wearing a kilt can look so different. I AM THE ONE ON THE RIGHT looking straight on, one might say the more handsome one, although my cousin might have something to say about that. I also bought a day jacket via the Internet, but when it was delivered to Coventry I found it was about 2 sizes too big,so I had to go to a professional tailor in Coventry and he fixed it as if it was made to measure, which it is now. It pays to buy good quality materials as they can be altered, but it also helps to go to a good kilt shop and get it right from the beginning.